Previously catching Amaranthe on their headlining run back in May, there was a bit of surprise to hear that they were going to embark on a second headlining run so soon. But there was also quite a bit of joy, being a big fan of the band, at an opportunity to see a full set once more before they retreat to write a new album. And as an added bonus, being able to check out the Matt Coe (and Matt Bower) approved local act Seven Spires. There was a bit of head scratching to upon entering Stafford Springs and seeing the size/location of the town. However, free and easy streetside parking in this quaint and intriguing little town (not to mention a little spooky) was the first perk. The venue itself had a nice feel to it from the outside, and the inside was even more impressive. A maximum 525 capacity, it was open with high ceilings and very well kept. In fact, upon entering the bathroom, it just seemed to be a much fancier (and cleaner) restroom that one gets used to when driving a few hours in any direction for a show. The bottom line is if you see a show getting booked here, it’s worth a few extra minutes’ drive to take in a performance. First up was the Boston-based theatrical/symphonic act Seven Spires. And what a way to start the evening it was! Adrienne Cowan’s spellbinding vocal range and guitarist Jack Kosto’s scorching solos were some of the highlights of the band’s all too short of a set. The way that Seven Spires could morph from the symphonic metal template to suddenly bring in an almost death metal-heaviness at a few moments was nothing short of impressive (as was Cowan’s vocal switch-ups and stage presence), and they could just as easily switch gears into the opposite direction (the bouncy and infectious groove of “The Cabaret of Dreams”). Indeed, there was a lot to like about the local act, and it’s probably safe to say we probably won’t be referring to them as a ‘local act’ for much longer. Next up was Lullwater. A strange billing if there was one. Lullwater’s sound was more akin to a ‘90s alternative/early ‘00s rock band than it was to metal. They also had a bit of that Southern swagger to go with it. Not exactly my cup of tea, but for what it’s worth, the band put forth some palpable energy on stage and it seemed to go over pretty well with the majority of the crowd. The band was clearly having a good time on stage, and that did carry over. Butcher Babies seem to be really picking up momentum lately. Attaching to a number of high profile tours (this, Gwar, Cradle of Filth) since the release of their new album, Take it Like a Man, it’s hard not to take notice of them. In fact, there was a portion of the crowd specifically there to see them. Not being entirely sure what to expect with their live act, they quickly proved themselves to be the real deal in the live arena. Vocalists Heidi Shephard and Carla Harvey were almost constantly on the move during the set: jumping, headbanging, and working the crowd. The entire band was energetic and said energy was quite infectious. They focused mostly on newer material, with cuts such as the thrashy “Igniter,” solid groove of “Gravemaker,” and the ballad-esque “Thrown Away” providing some highlights among older tracks like “Magnolia Blvd” and “Jesus Needs More Babies for His War Machine.” More than simply eye-candy, Butcher Babies seem quite intent to win over as many fans as possible in the live setting, and with performances like this it shouldn’t take too much effort. At last, it was Amaranthe’s time to shine. Last time around, screamer Henrik Englund missed the festivities and this time Jake E was sidelined. But the band brought in Chris Adam Hedman Sörbye (of Smash into Pieces) to fill in. This being the fifth night of the tour, it was impressive to see Chris belt out those lines with such confidence. There was a clear chemistry between him and the rest of band already (apparently Amaranthe is great at finding exceptional replacements when needed). As with the last time I caught them, Amaranthe’s live set focuses on the songs that allow them to interact with the audience as much as possible. There are the uptempo, move-around tracks like “Electroheart,” “Call Out My Name,” and “Razorblade,” sing-a-long friendly ballads like “Over and Done,” “True,” and staple “Amaranthine,” and some mid-tempo numbers like “Mechanical Illusion” and “Massive Addictive” to balance things out. The way they mesh everything together is outstanding. 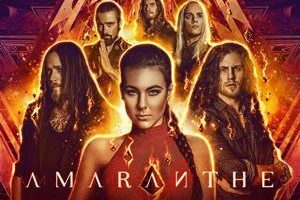 The band uses the tri-vocal nature of the material to their advantage and there’s never a dull moment on stage – there’s not a band that interacts with each other quite like the way Amaranthe does. Elize and Henrik have their own style of presentation but it all comes together nicely and you can tell they are just having fun on stage (not to mention Chris’ added impact). 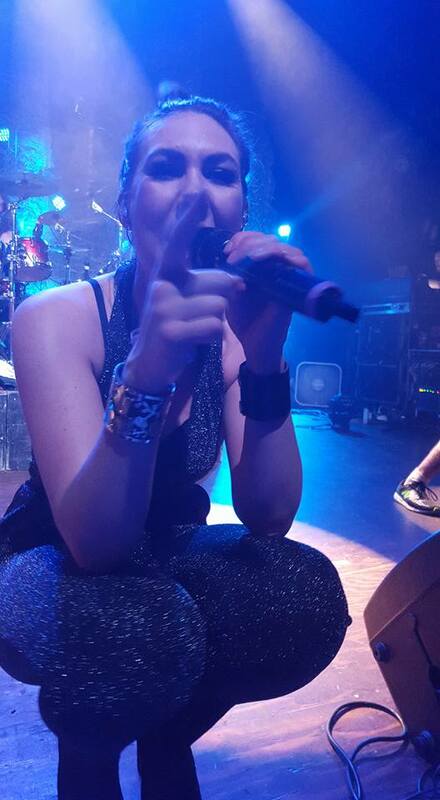 Watching/hearing Elize toss some added nuance and vocal flair to songs like “Dynamite” is a treat in and of itself. But most impressively is how they act as a team: everyone gets plenty of opportunity to shine. Outside of the vocalists and their playful interactions, guitarist Olof Mörck takes front and center during solos, Morten Løwe Sørensen gave us a killer drum solo, and bassist Johan Andreassen came out to pump up and joke with the crowd before the band’s encore (much like he did during the technical issues that caused the band to halt temporarily last time in Worcester). Amaranthe exudes massive amounts of stage energy because of this, and it’s hard not to partake in it. Another tail-end highlight was Seven Spires’ Adrienne Cowan getting on stage during the finale of “Drop Dead Cynical” to add to the vocal performance. Catching the band at such an intimate venue was certainly a treat, and with the way that they are deservedly skyrocketing in terms of success, it doesn’t seem like it’s going to be too much longer before they are headlining much larger venues. They are an exciting and extremely entertaining band to watch, and they are primed and ready for the next level (undoubtedly when album #4 hits the streets).